Welcome to R & R Reproductions! R & R was established in October 1993 by Ann Robbins and Pat Ryan. After meeting and sharing their love of antique samplers, they formed R & R to recreate samplers from private collections, museums or finds from their travels. Some of their reproductions are quite valuable because they remain true to the original pieces, right down to the tiniest of details such as a hanging thread. From an interview in The Stitchery Magazine, January 1999: “It was Sarah Anne Buck who started us hand-dyeing linen. We needed slate board green for her 1821 sampler,” Pat explains. “Manufacturers just don’t make those tones. So, we experimented. When stitchers saw the colors on our sampler models, they wanted similar fabrics. Soon, designers were calling us. Now we’re in the dyeing business.” All R & R Reproductions linens are hand-dyed, and will vary slightly in color, depending on the count and density of the linen. 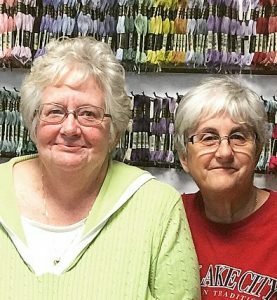 Ann and Pat hand dye more than 50,000 yards of linen each year. 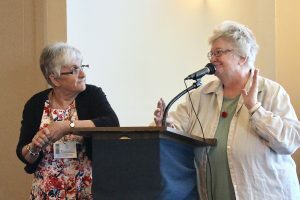 In addition to designing Reproduction Samplers and dyeing linen, Pat and Ann travel to shops across the U.S. , giving classes about the history of samplers, explaining the meaning of motifs, and sharing their own private collections. Pat has co-authored a book, “Historic Samplers” which is now out of print, and sought after by stitchers around the world. We were the first hand-dyed company in the U.S.
A retired color means that no one is currently using it and we need a minimum order of 5 yards to dye it. It could come back as an active color in the line. Never store hand-dyed fabrics in Ziploc-type plastic bags. You are only asking for trouble and color changes, as a type of chemical reaction takes place with plastic and dye stuffs used. Q-snaps can be used on hand-dyed fabrics if they are removed after each use and not left on the stitched piece for months at a time (chemical reaction again). We use both round fiber and full fiber dyes. A round fiber dye is a quick dip and only coats the surface of the fiber (not a good choice for pulled work or hardanger). A full fiber dye requires a longer dyeing process and the dye coats through the entire fiber (can be used for any needlework technique). Due to the ‘antiquing’ process and the dyes used, it is not recommended to wash R & R linens (especially the coffee dyes). With hand-dyed fabric, some raveling is involved; usually one or two inches, depending on the fabric. All fabrics are pre-ironed before shipment or sale. Most colors can be dyed in any thread count. We do NOT stock dyed fabrics–only the base fabrics to dye them on. Each order is custom dyed for your shop. We DO use coffee and espresso to dye with–the acid content has been tested and approved by museums all over the U.S.
R & R has a variety of colors using Coffee Dyes and Non-Coffee Dyes, as well as Discontinued Colors. Contact us for information about available colors.